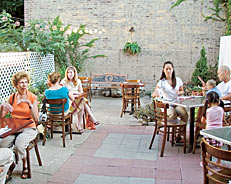 Time Out NY's 2007 Eat Out award for Best New Restaurant in Queens!! Thanks to everyone who voted for Quaint. 'Quaint' is a subjective adjective, one signifying different properties based on personal experience. Doilies, picket fences, the Amish, an AOL account--each might be considered 'quaint' by different people. My jaded, stone-cold Brooklyn spirit predisposed to scoffing at attempted preciousness found in Quaint a disarmingly warm restaurant, living up to its name in ways I suspect it didn't intend. The food was fantastic: green gazpacho--complements of the chef!--is a refreshing kiss of seasonal sunshine on a rainy evening; the 'crispy, spicy' calamari is just that, with huge fully-connected tentacles that I oh-so-covet; and the chicken is, literally, the BEST chicken I've had in the city. Though the food and atmosphere are typical of any BoCoCa bistro, it's the unaffected simplicity that makes Quaint a Sunnyside stand-out. No artfully-distressed paint, no gimmicky mismatched chairs, no purposely-aloof-bordering-on-godawful service (in fact, it was almost too quick and attentive, but how dare I judge?). In short, a welcome reprieve from the Brooklyn restaurant scene that deposited my dining partner and I back on the Skillman Avenue satisfied and speculating on Queens rent prices. Thanks, Quaint, for a nice meal without 20% attitude included. When I lived in Sunnyside, all I wanted was a welcoming joint where I could get a good burger and a glass of wine. It couldn't be found. Four years later I returned to the 'hood and found a Starbucks on my old corner, a hip spa a few blocks down and, yes, an airy new eatery with a seasonal American menu. Although its name suggests teacups and doilies, there's nothing kitschy about Quaint. The rust-colored walls and benches (plucked from an old synagogue) are more minimalist than frilly, attracting happily dressed-down locals. When we went, we spotted the chefs busy at work in the open kitchen while we dunked paper-thin grilled flatbreads ($6) into a garlicky honey spread and slurped mussels ($8) bathed in a fragrant coconut sauce. To fulfill my pig quota, I put an impressive dent in the brined pork chop ($16) wrapped in caul fat and stuffed with smoky house-made sausage that could make anyone renounce breakfast links forever. Moist chocolate stout cake ($5), looking like a bisected fluffy muffin, came topped with mint whipped cream and tasted a little like a pint going down. Considering the myriad old pubs in the neighborhood, it's a rather appropriate ending. While that may be true, Quaint has a classy look to it with muted lighting, an open air kitchen and a backyard for outdoor dining. The “used” furniture Chen mentions has obviously been carefully chosen to give the restaurant a, well, quaint feel. Instead of individual chairs, diners share converted pews purchased from a local synagogue. The cuisine is described as “New American” and the menu pairs down home appetizers such as macaroni and cheese with more sophisticated fare like grilled house flatbreads with white bean spread, olive walnut tapenade and garlic honey spread. The entrées are similarly eclectic with a house burger alongside interesting fish selections such as marlin—the catch of the day when we went—and grilled escolar. The menu draws on the produce of local farms in upstate New York and from Quaint’s own herb garden located behind the restaurant. Quaint is a New American Bistro dedicated to creating a neighborhood restaurant experience that maintains the classic attributes of warmth and affordability while delivering superior food and service. The seasonal menu will draw from the produce of local farms in upstate New York and from Quaint’s own herb garden located in the rear of the restaurant. Meet your host Tim Chen who is no stranger to the Chamber. Tim has been a member of the Chamber for over two years when he first attended a Chamber Restaurant month meeting. Tim Chen, a native New Yorker, bored with being a civil engineer, changed careers in 1997 by enrolling at the New York Restaurant School (now called the Art Institute). This led to an externship at the Upper East Side, three-star-rated March Restaurant, and a line cook position under Chef Wayne Nish. Since 1997, Tim has worked in every aspect of the Restaurant business. Check his résumé on their website. www.quaintnyc.com. A lot a time and energy went into the planning of this extraordinary restaurant and it is well worth your visit. I totally enjoyed the food, the ambience and the friendly service. By the way, while visiting the website check out the résumé of their well-qualified chef Joe Dobias, presently Joe is looking for an apartment in Sunnyside. (Realtors, take Note)! Sunnyside continues to prove it’s self that we have the best and finest restaurants in all of New York City. We welcome Tim and his great family friendly restaurant. Thanks for helping to keep Sunnyside the first place to come when you want to eat out and have a great meal!